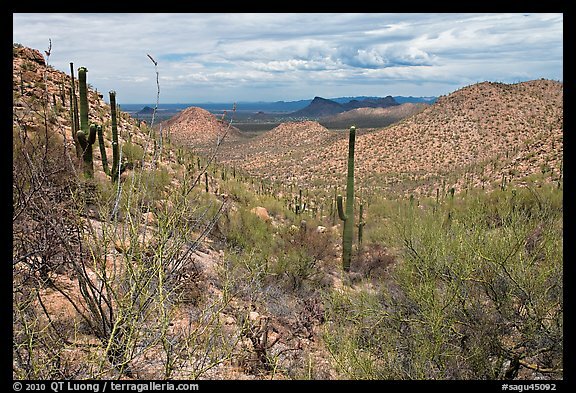 I’ve posted new images of Saguaro National Park, taken during a trip in May 2009. 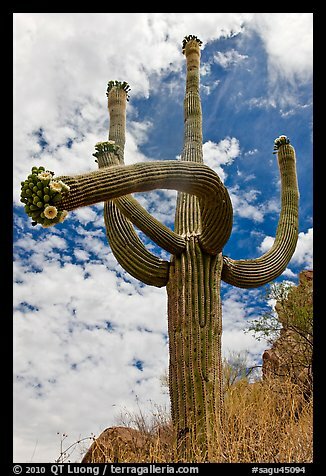 This was my third trip to Saguaro National Park, made expressly to capture the Saguaro cactus flowers. Those blooms may be the ultimate desert flowers. Their short life is unique: they open at night, and will close permanently during the next day, often in the morning if the day is sunny. The bloom, large, waxy, and very flagrant, has been adopted by Arizona as its official state flower. By the way, did you know that the saguaro cactus is a protected species through Arizona ? It is illegal to harm one. 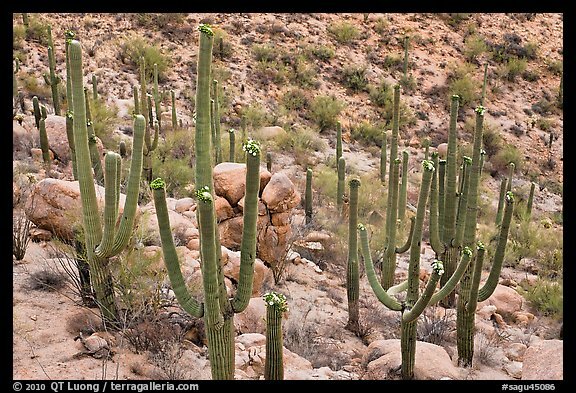 A permit is needed to remove a Saguaro cactus, even from your own backyard. The Saguaro cactus blooms mostly in May and June. The first time I visited was in early April. The weather was great, but the saguaro blooms were very sparse. After much exploring, I managed to find a few, and photographed close-ups, but I wanted to see more of them, and depict them in the landscape. My second visit was in March, timed for the annual flowers, which carpeted the desert floor on that an El Nino year. However, this was clearly too early for the Saguaro flowers. On this third visit, the weather was unusually cloudy for Arizona, but the flowers were there ! Photographing them presents a challenge, since they grow on top of the saguaros, which can reach dozens of feet in height for a mature cactus. I looked for a position above them, on steep slopes, and for specimen with arms curving downwards. Fantastic shots! Will be there (hopefully) in March for wildflowers–too bad I’ll miss the blooms this year!